A Round Celtic Spiral Pendant Bead is worked into a lead-free silver metal slide bail with a hole opening of approximately 3mm. 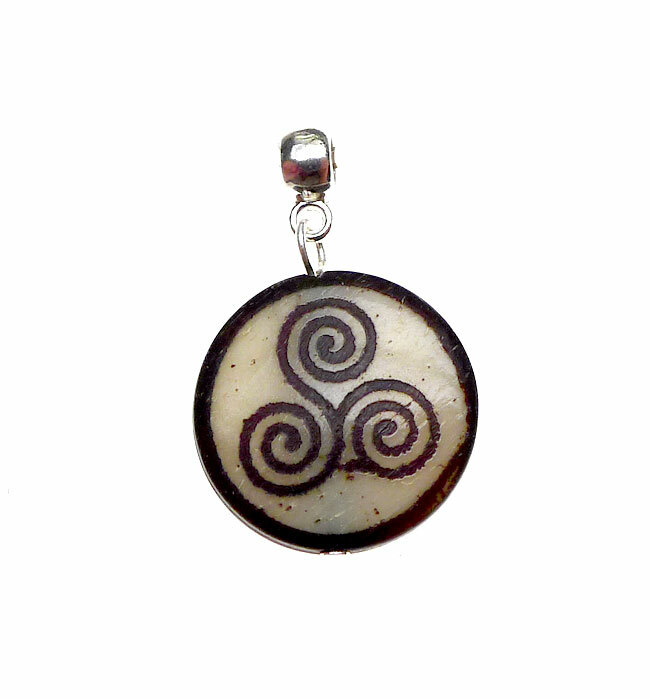 These Bone Triskele Pendants are double sided and measure almost 3/4-inch in diameter. These pendants are hand-made of natural Yak bone material so variations should be expected. Sold by Pendant. Tibetan bone jewelry is usually made from domesticated Yaks that have passed from natural causes. This is a beautiful way to embrace the Buddhist philosophy, because every time a wearer looks down they are reminded of the impermanence of life. Supplies > Beading Focals > Organic Pendants : Pearl, Bone, etc.